A famous delicacy of south india,gongura rice is so easy to prepare and tastes delicious..can be prepared in minutes of time..
Gongura paste: 1 cup Sorrel leaves/gongura should be well washed,boiled and made in to paste. Place a pan on the stove and add oil to it. Add methi seeds,seasoning materials one by one. Fry for 2 mins,next add red chilli,green chilli slits,curry leaves and garlic flakes. Mix and fry well,for 2 to 3 minutes in low flame. Next add gongura paste and mix well for 2 minutes,next add salt to it and mix well. Mix well,lastly add sesame powder / nuvvula podi..and mix well. Garnish with cilantro chop and serve hot..
Super yum... I love gongura in any form.And in yummy rice. 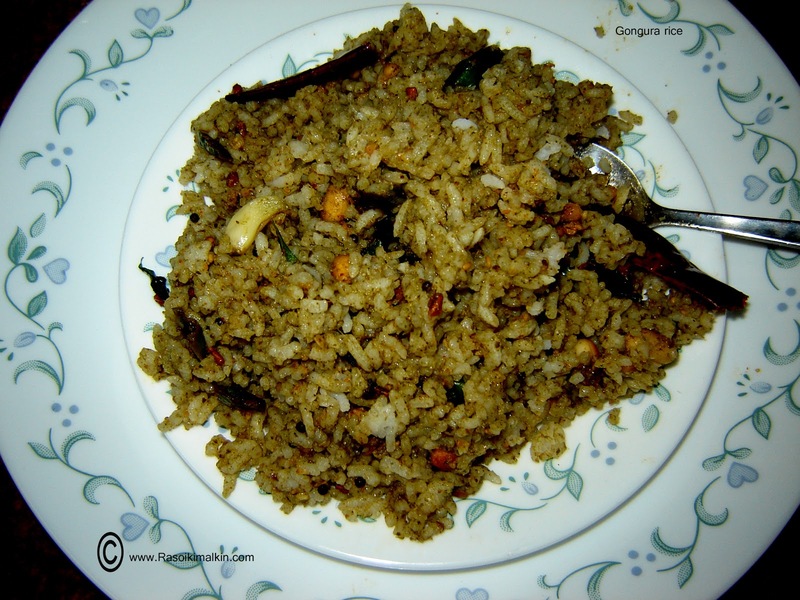 Gongura fried rice looks delicious. i love to taste them . A keeper recipe n very innovative too! I make only thogayal this is new to me. Looks nice.. This is something new which I haven't tried, looks yum!